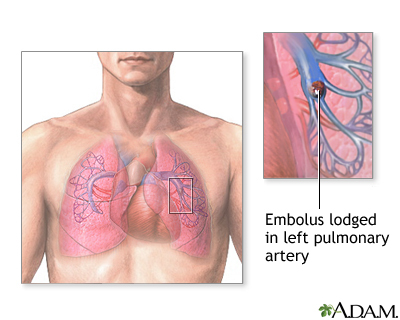 A pulmonary embolus is most often caused by a blood clot that develops in a vein outside the lungs. The most common blood clot is one in a deep vein of the thigh or in the pelvis (hip area). This type of clot is called a deep vein thrombosis (DVT). 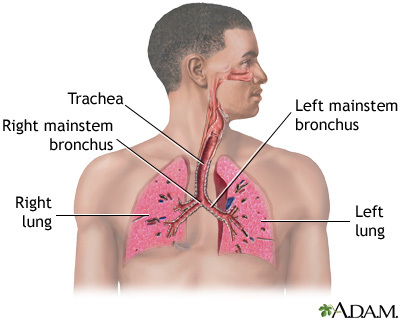 The blood clot breaks off and travels to the lungs where it lodges. Less common causes include air bubbles, fat droplets, amniotic fluid, or clumps of parasites or tumor cells. Diseases of the immune system that make it harder for the blood to clot. Inherited disorders that make the blood more likely to clot. One such disorder is antithrombin III deficiency. The health care provider will perform a physical exam and ask about your symptoms and medical history. You will receive medicines to thin the blood and make it less likely your blood will form more clots. In cases of severe, life-threatening pulmonary embolism, treatment may involve dissolving the clot. This is called thrombolytic therapy. You will receive medicines to dissolve the clot. You may be given pills to take or you may need to give yourself injections. For some medicines, you will need blood tests to monitor your dosage. How long you need to take these medicines depends mostly on the cause and size of your blood clot. Your provider will talk to you about the risk of bleeding problems when you take these medicines. If you cannot take blood thinners, your doctor may suggest surgery to place a device called an inferior vena cava filter (IVC filter). This device is placed in the main vein in your belly. 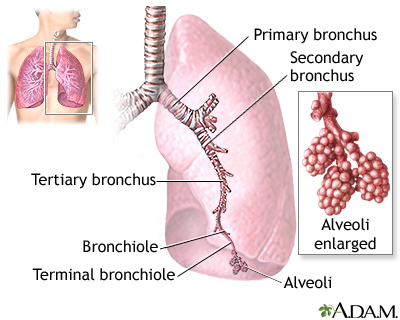 It keeps large clots from traveling into the blood vessels of the lungs. Sometimes, a temporary filter can be placed and removed later. Some people can develop long-term heart and lung problems. Death is possible in people with a severe pulmonary embolism. Go to the emergency room or call the local emergency number (such as 911), if you have symptoms of pulmonary embolus. Blood thinners may be prescribed to help prevent DVT in people at high risk, or those who are undergoing high-risk surgery. If you had a DVT, your provider will prescribe pressure stockings. Wear them as instructed. They will improve blood flow in your legs and reduce your risk of blood clots. Moving your legs often during long plane trips, car trips, and other situations in which you are sitting or lying down for long periods can also help prevent DVT. People at very high risk for blood clots may need shots of a blood thinner called heparin when they take a flight that lasts longer than 4 hours. Do not smoke. If you smoke, quit. Women who are taking estrogen must stop smoking. Smoking increases your risk of developing blood clots. Guyatt GH, Akl EA, Crowther M, et al. Executive summary: antithrombotic therapy and prevention of thrombosis, 9th ed: American College of Chest Physicians evidence-based clinical practice guidelines. Chest. 2012;141(2suppl):7s-47s. PMID: 22315257 www.ncbi.nlm.nih.gov/pubmed/22315257. Kline JA. Pulmonary embolism and deep vein thrombosis. In: Marx JA, Hockberger RS, Walls RM, et al, eds. Rosen's Emergency Medicine: Concepts and Clinical Practice. 8th ed. Philadelphia, PA: Elsevier Saunders; 2014:chap 88. Weitz JI. Pulmonary embolism. In: Goldman L, Schafer AI, eds. Goldman's Cecil Medicine. 25th ed. Philadelphia, PA: Elsevier Saunders; 2016:chap 98. Yi-Bin Chen, MD, Leukemia/Bone Marrow Transplant Program, Massachusetts General Hospital, Boston, MA. Also reviewed by David Zieve, MD, MHA, Isla Ogilvie, PhD, and the A.D.A.M. Editorial team.